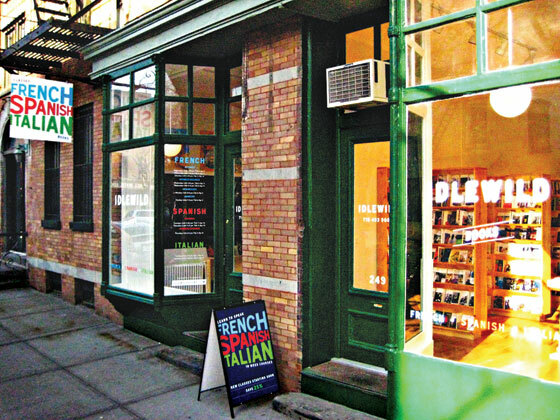 Congratulations to Idlewild Books, founded in 2008 in New York City by David Del Vecchio: the travel guide and literature store has opened a second location, in Cobble Hill, in Brooklyn, where it is selling foreign-language books only--mainly literature and children's books in French, Spanish and Italian--and holding language classes, some of which are its first for children. "We love the neighborhood--with its strong Italian roots and growing reputation as New York's Little France--and our neighbors have already made us feel welcome," the store wrote in an e-mail to customers. "And in addition to thousands of great foreign-language books, we also have two great French-speaking staff members--Marie from France and Laetitia from Belgium--who will be happy to assist you in the new shop." Idlewild Brooklyn is located at 249 Warren St. (between Court and Smith), Brooklyn, N.Y. 11201; 718-403-9600. 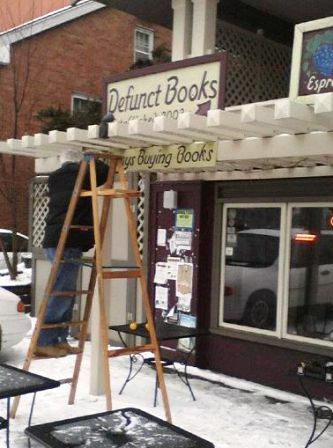 Defunct Books, Iowa City, Iowa, is not defunct. Given 30 days to vacate its space, Defunct will move to a former Waldenbooks location at the Sycamore Mall. The store's current space is 950 square feet; at the mall it will expand to 2,500. Defunct owner Gregory Delzer told the Press-Citizen that after the eviction notice, he considered selling books only online but was approached by the mall about locating in the former Walden space. Mall general manager Kevin Digmann said that Walden "did well" and the mall had been trying to find a bookstore to fill the space. The building where Defunct Books is currently located is being razed and replaced by an apartment complex. 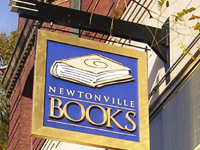 In April, Newtonville Books in Newtonville, Mass., is moving to Newton Centre. The store's main reason: "There is a wide swath of book lovers who can't attend our events because we're not off the subway system. For this reason, we decided to move to Newton Centre." With the move to Langley Place, the store will no longer carry used books and will expand the children's section. Owner Mary Cotton wrote to customers that although "the bookstore's exit from Newtonville leaves a void in the village... it's our intention to keep growing the store and servicing the Newton community with a terrific selection of books and literary programming." Cotton bought Newtonville Books five years ago from Tim Huggins, who founded the store in 1998. Richard M. Ketchum, an author and editor who wrote more than a dozen books--including six focused on the American Revolution--died January 12, the New York Times reported. He was 89. Ownership of e-reader devices and tablets by adults in the U.S. nearly doubled, in both cases to 19% from 10%, over the holiday season, and the number of Americans owning at least a tablet or an e-reader device rose to 29% from 18%, a PewInternet survey has found. The survey attributed the major gains to the launch of Amazon's Fire and Barnes & Noble's Nook Tablet at lower prices than Apple's iPad and other tablets as well as major price reductions on the Kindle and Nook. 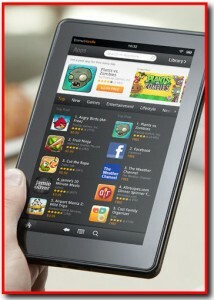 There may be more profit in Amazon's Kindle Fire than previously anticipated. RBC Capital analyst Ross Sandler reached this conclusion after assessing the "results of a proprietary survey of 216 Kindle Fire owners," Forbes reported. "One high level conclusion is that Kindle Fire unit economics are likely to be more favorable than consensus expectations, based primarily on frequency of digital goods purchases," Sandler wrote. "Our assumption is that Amazon could sell 3-4 million Kindle Fire units in Q4, and that those units are accretive to company-average operating margin within the first six months of ownership. Our analysis assigns a cumulative lifetime operating income per unit of $136, with a cumulative operating margin of over 20%." Most frequent uses for the Fire were e-book reading (71%) and browsing the Web (39%). Most important reason given for buying a Fire: gift (47%), features (27%) and price (20%). More than 80% of Fire owners have purchased an e-book, and 58% had purchased more than three e-books within 15-60 days of purchase. More than 70% had not used the Fire to buy physical goods on Amazon.com. A post-holiday survey of more than 1,400 people in the U.K. found that that 48% admitted they had received a gift on Christmas Day, but hadn't used it since opening the package. When asked by the pollster--MyVoucherCodes.co.uk--"to identify the gift, 22% said it was an Amazon Kindle, which over half (53%) saying it was because they had not downloaded any books to be able to use with the device yet," PC Advisor reported. 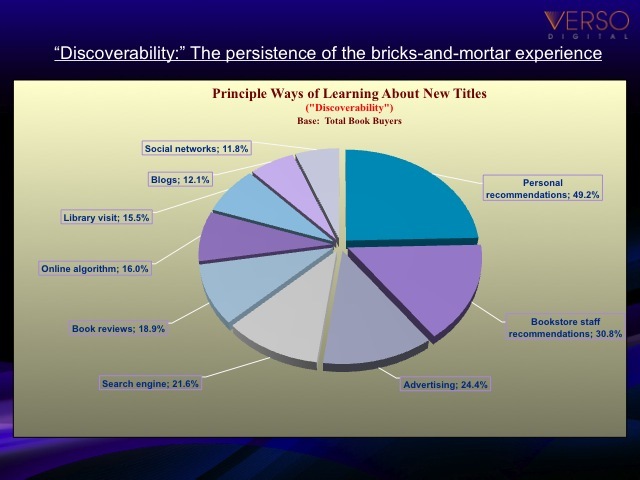 Once again, Jack McKeown's presentation of the Verso Digital survey of consumer purchasing behavior was a highlight of the Winter Institute and reinforced the sense among indies that there are plenty of opportunities for bricks-and-mortar bookstores in the post-Borders, digital era. This year, the survey benefited from having data from the previous two years for comparisons. McKeown, who is Verso's director of business development and was also at the Winter Institute as a bookseller--he is president of Books & Books Westhampton Beach, Westhampton Beach, N.Y.--emphasized that many in the business like to use Darwinian metaphors for what's happening in the book world, implying that the growth of e-books and e-book readers is a zero-sum game pitting print against digital and that the book business will follow the course of the music world, where most bricks-and-mortar music retailers have vanished. But the findings of the Verso survey suggest a different model, McKeown said, one of symbiosis mirroring the situation of species who "depend on each other for survivability." most Borders customers were casual shoppers and are still "up for grabs"
Avid readers--those who purchase 10 or more books a year--tend to be older, female, wealthier and better educated--and represent 30.2% of the U.S. adult population, about 70 million people. "They are the market that's a driver for our industry," McKeown said. These avid readers buy books for a variety of reasons, including entertainment/relaxation (32%), education and self-improvement (22%) and for gifts (14%). Readers find out about books mostly through personal recommendations (49.2%), bookstore staff recommendations (30.8%), advertising (24.4%), search engine searches (21.6%) and book reviews (18.9%). Much less important are online algorithms (16%), blogs (12.1%) and social networks (11.8%). These results "reaffirm the power and necessity of bricks-and-mortar stores and traditional marketing efforts," McKeown commented. Among the reasons for that disconnect are that many readers have a habit of splitting their purchases between a variety of retailers and sometimes buy online after seeing a book in a store. All book buyers buy their books, in order, online (49%), at chain bookstores (42.7%), local indies (36%) and big box retailers (24.3%). Avid readers tend to buy even more online (65.5%) although avid readers buy almost as often at indies (47.5%) as at chain bookstores (51.4%). A contributing problem is that only 44.9% of all readers live or work within 10 miles of an indie bookstore compared to 56% who live or work within 10 miles of a chain bookstore. This obviously "depresses visits to indies," McKeown noted. Yet the situation offers independents opportunities, the biggest of which is for indies to focus on what McKeown called "the next sale." Because consumers' splitting of purchases between various retailers has become "ingrained behavior," indies should focus less on making readers indie-exclusive customers and more on converting some of the customers' purchases to indies--or the "next sale." "I contend that one reason Small Business Saturday [on the Saturday after Thanksgiving] was so effective was because it was geared to that next sale," McKeown said, adding that an "enormous payoff" can come from "changing a marginal pattern of behavior." Such efforts can be done at the local or national level. A large section of the survey concerned Borders shoppers, whose loyalties are far from set. Some 60% of all book buyers shopped at Borders, and a majority of them were "occasional shoppers," with only 10.1% of them visiting Borders 10 or more times a year. Of those who have bought more at other places since Borders closed, they have shopped more online (36.1%), at other chain stores (27.2%) and indies (23.1%). But 60.7% of former Borders shoppers have not increased visits to other shopping locations, and are "in play," as McKeown put it. "The battle for market share for Borders customers is a battle for the occasional book shopper. Again it's all about the next sale opportunity." He noted that business from former Borders customers will be disproportionately felt around such "gift-buying opportunities" as Christmas, graduation, Mother's and Father's Days and was likely a major factor in the boom in holiday sales at indies. McKeown recommended that indies "tie in with local event calendars" for these customers and offer special Saturday promotions. 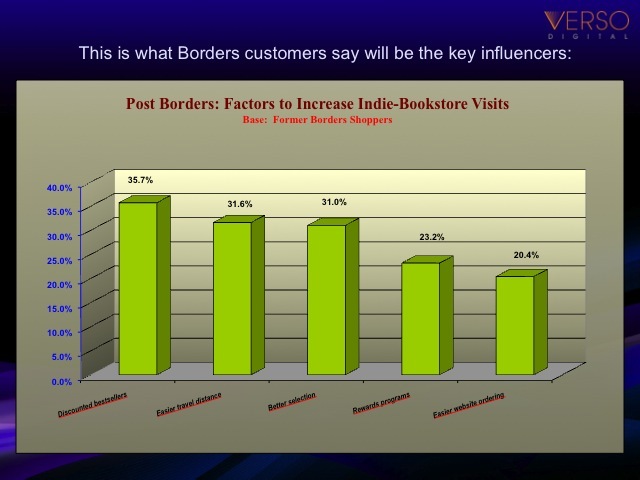 Former Borders customers also indicated that they would visit indies more often if indies offer discounted bestsellers (35.7%), have a better selection (31%), have rewards programs (23.2%) and offer easier website ordering (20.4%). Perhaps the most important section of the survey had to do with e-books and e-reading devices--which again included findings that make the digital changes of the past several years appear more like an addition to the book world rather than a revolution that will destroy all non-digital parts of the business. The survey, conducted before Christmas, found that 15.8% of readers already own an e-reader device, up from 7.9% a year earlier and 2.9% two years before. Some 16.3% of readers are either very likely or somewhat likely to buy an e-reader. But strikingly a majority--51.8%--of readers are "not at all likely" to buy an e-reader, up slightly from 49% a year earlier and from 40.2% two years before. This indicates a strengthening of resistance to e-readers and may foretell a plateauing of growth in e-reader device sales (which McKeown said could be 25%-30% in three years). Among avid readers, 22.3% already own an e-reader and 49.7% of them are not interested in buying an e-reader. Following earlier technological adoption patterns, the e-book reader world has gone from innovator and early adopter stages into the early majority state, McKeown said. Now "the battle is what happens with the late majority and laggards." Usually what makes such people adopt new technology is a new device that "increases the relative advantage to them so it's no longer worth their while to resist." In the music world, that device was the iPod. 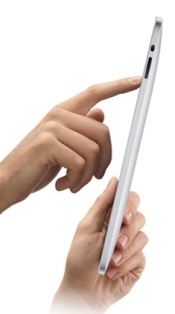 "Is there such a device looming for e-readers?" McKeown asked. "Perhaps some kind of virtual reality device, but I don't see it happening." In e-book sales, fiction "still dominates," but "we're starting to see nonfiction categories rising," and they are increasingly beginning to mirror sales in printed books. 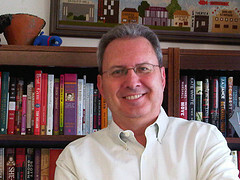 "We can no longer say that e-books are primarily a fiction or genre fiction market," McKeown said. "This is further confirmation that we're out of the early adopter phase." Among e-reader device and tablet owners, 29.6% plan to buy 10 or more e-books in the next year, mimicking the plans of avid readers. 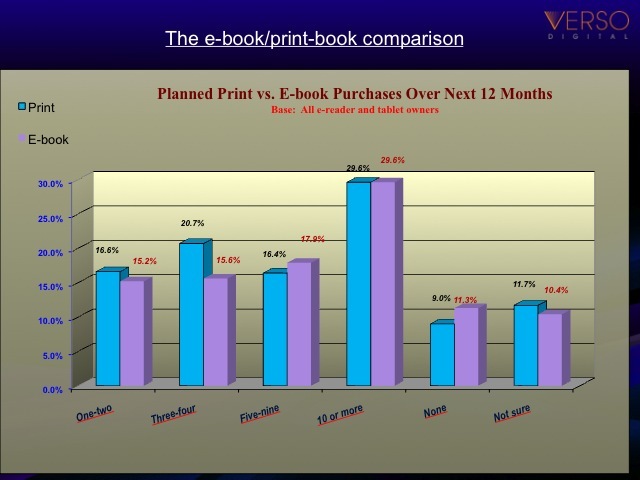 Interestingly 24.9% of the same group plan to buy 10 or more printed books in the next year. And among avid readers who own an e-reader device or tablet, 42.8% plan to buy 10 or more printed books (while 47.6% of such owners plan to buy 10 or more e-books). "These are split purchasers," McKeown stated. "They will not be dictated to. They like both formats, which are not mutually exclusive." He called the situation "very nuanced," one that indicated a strong hybrid market. Survey respondents also indicated an interest in an indie-brand e-reading device. Of all readers, 9.5% were very likely to buy such a device and 18.3% were somewhat likely to do so. 33.1% of women over 44 are likely or very likely to buy such a device. Some 40% would pay up to $100 for such a device and 32% would pay between $100 and $130. Beloved by the 500 booksellers in the audience, Carl Lennertz, who is now executive director of World Book Night in the U.S., gave an overview of the program, which makes its debut here on April 23. He emphasized the major role booksellers can play: the books that volunteers give out on World Book Night are distributed through companies and organizations like bookstores. Lennertz suggested that bookstores host parties a week or so before World Book Night for the volunteers who will pick up copies of their books at the stores. He also noted an idea from Carole Horne at the Harvard Book Store, Cambridge, Mass., to have a party after a week later, so that the book givers could share their experiences. Lennertz emphasized that publicity is important to the program. "I don't care about national media, but I want 100 local news stories" because "when the public hears message, they get it right away." He said he envisioned many events across the country. Jane Streeter, president of the Booksellers Association of the U.K. and Ireland and founder of the Bookcase, Lowdham, Nottingham, discussed how the first World Book Night, held last year, unfolded. "Normally we're shamelessly borrowing your ideas, so it's good to share this one," she said. The main focus was the same as World Book Night: spreading the "joy and love of reading." The program tapped into "what we do every day, talking about books we love and putting them in hands of people." Booksellers found, she said, that the World Book Night led to increased sales, introduced more people to reading and stores and brought more foot traffic. "There were hundreds of heartwarming stories." She endorsed the idea of bookstore parties, saying, "A party is good. Champagne obviously. Cake obviously." She also showed a video from an event that night in Trafalgar Square in London that featured appearances by many authors whose books were part of the program. 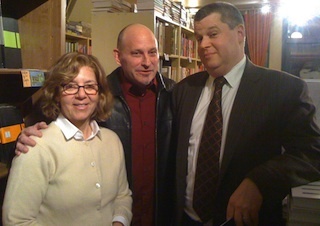 Last Thursday Daniel Handler (aka Lemony Snicket) and Maira Kalman presented their YA novel, Why We Broke Up (Little, Brown Books for Young Readers), to an SRO crowd at WORD, Brooklyn, N.Y. Before the event, they chatted with fellow kids' author Jon Scieszka (center). Free-Range Chicken Gardens: How to Create a Beautiful, Chicken-Friendly Yard by Jessi Bloom, photographs by Kate Baldwin (Timber Press). This morning on Imus in the Morning: Patricia Cohen, author of In Our Prime: The Invention of Middle Age (Scribner, $25, 9781416572893). This morning on Good Morning America: RoseMarie Terenzio, author of Fairy Tale Interrupted: A Memoir of Life, Love, and Loss (Gallery, $25, 9781439187678). She will also appear on the View and CNN's Piers Morgan Tonight. Also on the View: Janet Evanovich, co-author of Love in a Nutshell (St. Martin's Press, $27.99, 9780312651312) and author of Explosive Eighteen (Bantam, $28, 9780345527714). The movie based on her One for the Money opens this coming Friday. Tonight on the Colbert Report: Bruce Bueno de Mesquita, co-author of The Dictator's Handbook: Why Bad Behavior is Almost Always Good Politics (PublicAffairs, $27.99, 9781610390446). Tomorrow morning on the Today Show: Wael Ghonim, author of Revolution 2.0: The Power of the People Is Greater Than the People in Power (Houghton Mifflin Harcourt, $26, 9780547773988). Tomorrow morning on CBS' This Morning: Stephen Fry, author of The Fry Chronicles (Overlook Press, $29.95, 9781590207147). Tomorrow on the View: Dylan Ratigan, author of Greedy Bastards: How We Can Stop Corporate Communists, Banksters, and Other Vampires from Sucking America Dry (Simon & Schuster, $25, 9781451642223). Tomorrow on NPR's Fresh Air: Paul M. Barrett, author of Glock: The Rise of America's Gun (Crown, $26, 9780307719935). Tomorrow on NPR's Diane Rehm Show: Gail Collins, author of William Henry Harrison (Times Books, $23, 9780805091182). Yesterday, the BBC premiered Birdsong, a two-part adaptation of the novel by Sebastian Faulks. The show is scheduled to hit American TV screens as part of the PBS Masterpiece series in April. This trailer will give you a brief preview. The National Book Critics Circle awards finalists have been named. Winners will be announced March 8 at the New School in New York City. The NBCC's Nona Balakian Citation for Excellence in Reviewing went to Kathryn Schulz, and the Ivan Sandrof Lifetime Achievement Award was given to Robert Silvers, editor of the New York Review of Books. In Audrey Schulman's (The Cage) ingeniously plotted novel, we read two stories, happening 100 apart, that come together in a most unexpected way. In 1899, Jeremy, a young engineer, leaves his small town in Maine to oversee construction of a railroad across East Africa. He's left home because of a secret that has alienated him from everyone. The new start in Africa is a rocky one. He is wracked by malaria, afraid of much of what he encounters, bereft of companionship and, worst of all, his camp is attacked by two lions who drag sleeping Indian workers to their deaths. Because he is the white man with the gun, he must hunt and kill the lions. A skilled African hunter assists him, though Jeremy must make the kill. Finally, he fulfills his mission and is lauded by all, but his hunter-guide moves on, leaving Jeremy once again bereft. As the new century dawns, he makes an unusual connection with another person--one that will resonate through the years. In 2000, Max, an ethnobotanist, is a high-functioning autistic, unable to make eye contact or to bear being touched by anyone. Her social skills may be lacking, but her credentials are in order---she travels to a gorilla station in Rwanda for a pharmaceutical company in search of a vine that might have lifesaving properties. Mountain gorillas are benefiting from the vine, showing a marked reduction in cardiovascular ailments, so the company wants her to bring it back for their use. The other women in the station--and one man, a native--are unwilling to help Max, although they all know where the vine is. If the vine is found, the pharmaceutical company will harvest it, withdraw all financial support from the station and remove the hired guards. The mountain gorillas--already driven to a habitat too high for long-term survival--will be hunted as bushmeat. The differing agendas of the women are spelled out, but what none of them expect is an invasion by the Kutu from Congo. They draw closer every day; these warriors are children in cast-off wedding dresses and too-big sneakers bearing Kalashnikovs they are only too happy to use. These are kidnapped children who have known nothing but war and deprivation; automatons with killing weapons. Max is utterly fearless and forms a real connection with the gorillas, especially with Rafiki, whose child, Asante, she saves from eating deadly nightshade. Rafiki leaves food for Max, and Titus, the alpha male, saves her from falling out of a tree. Schulman paints an unforgettable picture of this young woman who has never had a friend or lover bonding with the primates in a tender and mutually respectful way. 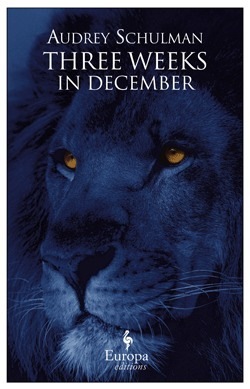 Shelf Talker: Two stories set in East Africa, 100 years apart, come together in a surprising way.